Have you ever thought about working on a cruise ship as a deck, engine, or electro-technical officer? Warsash Maritime Academy in Southampton, UK will be holding a Career Open Day on Saturday, February 2, 2019. Their open days aim is to give you an insight into what a career in the maritime industry has to offer, and the training programmes necessary to qualify as a ship’s navigation, engineer or electro-technical officer in the Merchant Navy, cruise industry, and the superyacht industry. 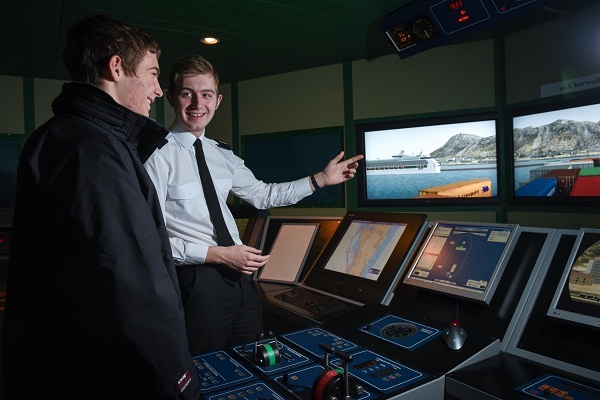 Many of the major British shipping companies and recruitment and training representatives who recruit cadets and crew will be there to give information about the career opportunities they offer. Representatives from Carnival UK, Princess Cruises, Viking Recruitment, V-Ships, Chiltern Maritime, and Clyde Marine Training will be attending the Career Open Day, and available to talk about cruise line sponsored cadetships. Warsash’s teaching staff will also be on hand to talk about the academic side of training. You can talk to current officer cadets, who are often happy to share their first-hand experience of the training and life as a cadet, both at Warsash and on board ship. You’re welcome to tour the new St Mary’s campus, and you’ll also be able to visit the engineering and ETO workshop. There will also be ‘life as an officer’ presentations, as well as demonstrations in the electronic chart display simulation suite. The David Moxon student residence – where cadets can live – will also be open to visitors for guided tours. For more information about the Career Open Day, visit Warsash’s website. You can also read, Cadet Training Programs for Cruise Ship Jobs for more information.